Please go to Marine Planktonic Copepods to access the species page hosted by the Marine Planktonic Copepods Website. We thank the UPMC Univ Paris 06, UMS 2348, Observatoire Océanologique, F-66651, Banyuls-sur-Mer, France for permission to access their species pages. A calanid copepod of the genus Calanus. In the North Atlantic, C. glacialis can be confused with congeners C. finmarchicus in the N. Atlantic and C. marshallae in the N. Pacific which both overlap in size and range with C. glacialis. Other species of Calanus overlapping in range with C. glacialis are C. hyperboreus, a significantly larger species and C. helgolandicus, a significantly smaller species. 1. the more elongated outer ramus of the left 5th leg in the male. 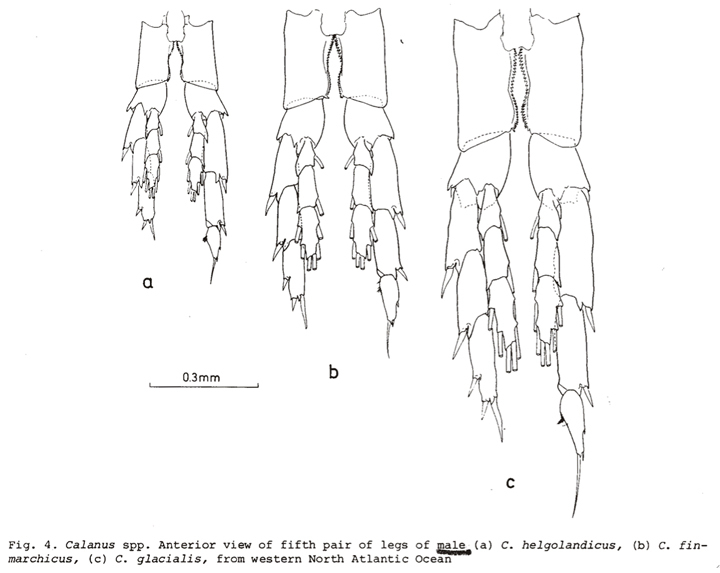 3. the female 5th leg basipod of C. glacialis has a curved interior margin; C. finmarchicus' is straight. 7. the pore signature pattern of integumental organs as described by Fleminger and Hulsemann (1977). 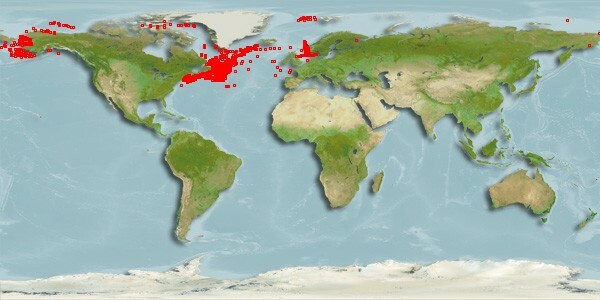 8. the geographical range of C. glacialis is more northerly than C.finmarchicus in the western N. Atlantic and also occurs in the polar waters of the N. Pacific where C.finmarchicus is absent. 2. on average, C. glacialis is larger than C. marshallae (female prosome 2.7-4.2, Frost, 1974) although their sizes overlap. 3. the female 5th leg basipod of C. marshallae has a slightly more curved interior margin and fewer denticles, on average (Frost, 1974). 6. geographic distribution: C. marshallae has been identified only in the N. Pacific. 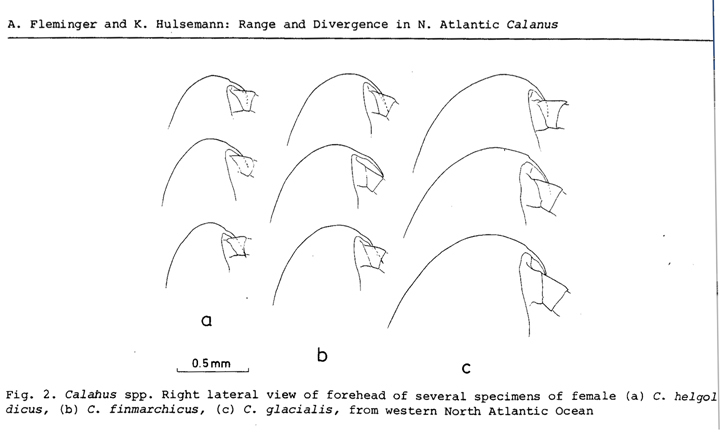 1. the more evenly rounded frontal part of the female head; C. helgolandicus is more pointed. 2. the longer caudal rami. 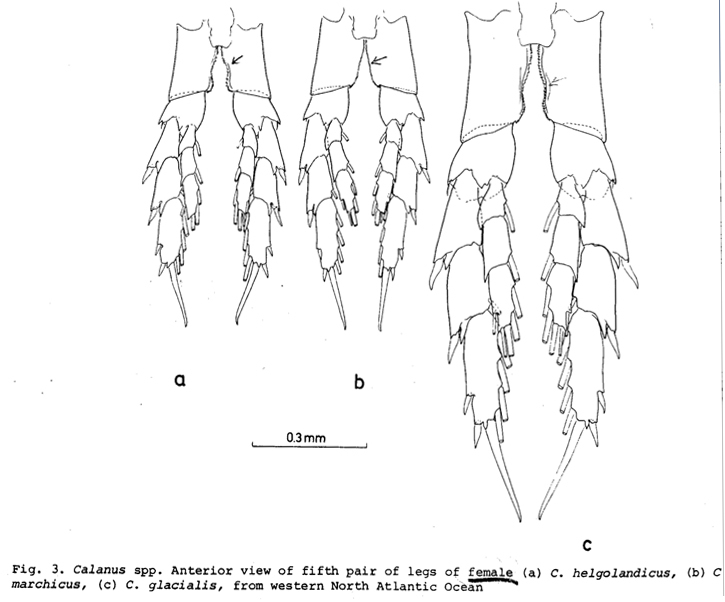 4. the geographical range of C. helgolandicus is centered in the eastern N. Atlantic and warmer waters of the western N. Atlantic while C. glacialis is primarily an Arctic species found in both the N. Atlantic and N. Pacific. 1. the fifth posterolateral margin of the fifth thoracic segment has pointed tips on C. hyperboreus male, female, C5 and C4. Depth distribution: epipelagic (0-500 m), or mesopelagic (500-1000 m). This information was compiled and submitted by N. Copley. Comparison of sizes of 3 common northern Calanus species. 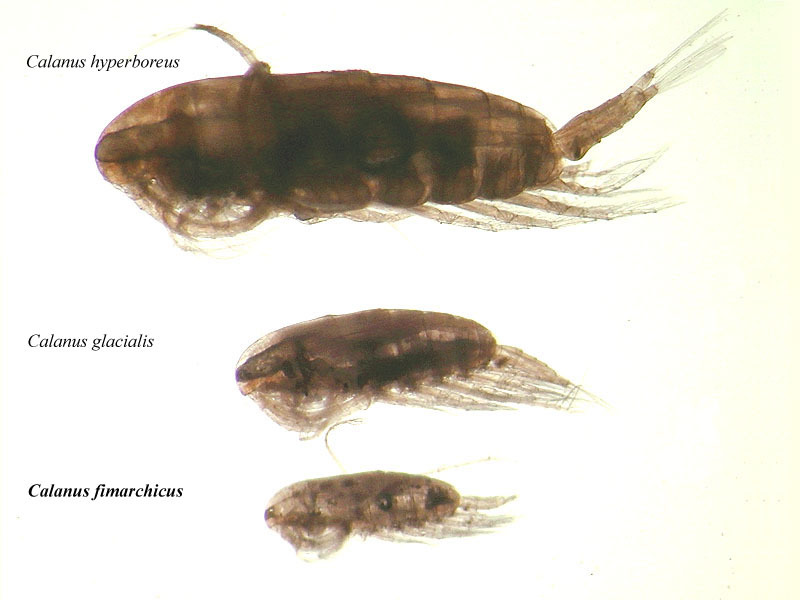 a. C. hyperboreus, b. C. glacialis, c. C. finmarchicus. Photo by S. Kwasniewski / IO PAS.